Earlier this week I was sad to I read about American journalist, James Foley being beheaded by ISIS. It is tragic what this group is doing around the world! We hear not only of ISIS but of multiple terrorist groups armed and determined to wipe out anyone that does not follow their radical beliefs. They target Jews, Christians and fellow moderate Muslims with abandon. We are living in some pretty dark times. With wars, rumors of wars, great persecution, natural disasters and an overall increase in sin we don’t have to look too hard to believe that we are living in the end times. How long things will go on for before Jesus returns, we don’t know but it sure is closer than it was but a few years ago. 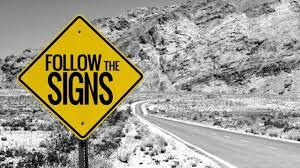 Let’s take a look at just some of these signs from the book of Matthew. 4 Jesus answered: “Watch out that no one deceives you. 5 For many will come in my name, claiming, ‘I am the Messiah,’ and will deceive many. 6 You will hear of wars and rumors of wars, but see to it that you are not alarmed. Such things must happen, but the end is still to come. 7 Nation will rise against nation, and kingdom against kingdom.There will be famines and earthquakes in various places. 8 All these are the beginning of birth pains. 9 “Then you will be handed over to be persecuted and put to death, and you will be hated by all nations because of me. 10 At that time many will turn away from the faith and will betray and hate each other, 11 and many false prophets will appear and deceive many people. 12 Because of the increase of wickedness, the love of most will grow cold,13 but the one who stands firm to the end will be saved. 14 And this gospel of the kingdom will be preached in the whole world as a testimony to all nations, and then the end will come. Does any of this sound familiar? All it takes is for us to turn on our tv news channel or open a newspaper and we can see each and every one of these things happening right now in our time. We have brothers and sisters in Christ worldwide that are dying for their faith at the hands of their persecutors, all because they will not renounce the name of Jesus Christ as their Lord and Savior. Wickedness is everywhere. We hear daily of family members killing other family members, adultery, sexual sin, murders happening in each and every one of our neighborhoods. Famines and earthquakes are at an all time high along with other various natural disasters. Nations are definitely rising against nations and kingdoms against kingdoms. There are too many cults and cult leaders to list here preaching a false gospel that denies the Lordship of Jesus Christ and the need for salvation rather promoting themselves and their false ideology. With modern technology and the ease of travel, the gospel is now being spread in countries that would never have had access to the gospel before. The message of salvation is being preached throughout the world! Though the Word of God tells us that no man knows the day or hour when Christ will return, we do know from the signs that the time is getting closer. With that in mind, God does not want us to walk in fear or trepidation. Jesus said, “See to it that you are not alarmed,” instead we are to walk in peace knowing these things must come to pass before we see our beautiful Lord and King face to face. It is so important that we use the time God has given us to share the gospel to those who need to hear! We need to daily demonstrate the love of Christ to a world looking for answers. People are wondering what on earth is going on in this crazy world of ours right now and we have the answers. We don’t need to be caught off guard. Our Bible tells us what must happen before Jesus returns. 36 “But about that day or hour no one knows, not even the angels in heaven, nor the Son, but only the Father. 37 As it was in the days of Noah, so it will be at the coming of the Son of Man. 38 For in the days before the flood, people were eating and drinking, marrying and giving in marriage, up to the day Noah entered the ark; 39 and they knew nothing about what would happen until the flood came and took them all away. That is how it will be at the coming of the Son of Man. 40 Two men will be in the field; one will be taken and the other left. 41 Two women will be grinding with a hand mill; one will be taken and the other left. 42 “Therefore keep watch, because you do not know on what day your Lord will come.43 But understand this: If the owner of the house had known at what time of night the thief was coming, he would have kept watch and would not have let his house be broken into. 44 So you also must be ready, because the Son of Man will come at an hour when you do not expect him. I want to be ready when He returns! I want to be busy doing His will! I want to be excited, and without shame, to see Him face to face! Is it time YOU lightened up the darkness? Today Christians are being persecuted and martyred all over the world. Evil is increasing. What is wrong according to scripture seems right and what is right according to scripture seems wrong! Believers are being caught up in all kinds of false doctrine and abandoning their faith. The picture looks a wee bit gloomy! However, there is another side to this picture. Things are happening just as our Savior said they would. He is not taken by surprise and neither should we be. As we see prophecy being fulfilled it should encourage each and every one of us to prepare for our King’s return! We should use our time wisely and share the love of Christ and the gospel freely! We who know Christ as Lord need not sit back and criticize unbelievers. They are unbelievers and therefore do not know Christ nor have the Spirit of truth in them. We can’t expect them to act or behave as those of us that do. They need to hear the truth! They need to see it demonstrated in the lives of every born again believer! They need our prayers! Instead of getting discouraged and disheartened, why not get busy doing the work we have been called to do. To live our lives as the salt of the earth, the light of the world. Let’s encourage one another as we journey through these dark days! Let’s remember that He is coming back for a church without spot or wrinkle. Let’s be that church! 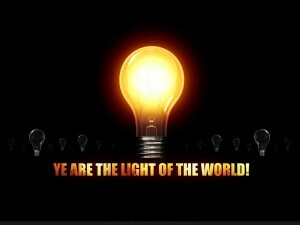 Let’s bring the light of Christ to a dark world that desperately needs Him!